A concerned mom told me at a gathering, “At least he’s just smoking marijuana.” Over four years later I saw that same mother again. Her son was still where he was in life when we last talked. “At least he’s just smoking marijuana,” she said. “At least I think he’s just smoking marijuana.” It used to be the great staller of the way forward and still is. But these days it’s so much more than that. It’s potent, it’s scary and it’s on the move. To make my point, “Each year more teens enter addiction treatment with a primary diagnosis of marijuana dependence than all other illegal drugs combined.” – National Council on Alcohol and Drug Dependence. COMBINED. Marijuana was the third drug that broke my heart. Cigarettes and alcohol didn’t prepare me for the pot find in Ted’s backpack. My security threat level upped to yellow; gateway color to the eventual red. Kids — and many adults for that matter — are very good at insisting that marijuana is harmless. They’ve done their homework and they’ve fine-tuned their argument. They have examples. They have websites. They ask us if we smoked pot. They believe the comments under You Tube posts and argue that no state in it’s right mind would legalize a dangerous drug. Well, they got us on that one. What I find fascinating in the debates is that people in recovery for drug addiction are not polled Only the self-proclaimed experts who currently smoke marijuana weigh in. The young people I know in recovery say marijuana is a gateway drug. Some say they “smoked non-addictive marijuana every single day,” until it was not enough. You decide for yourself. Start with some readable research from Educating Voices on marijuana. Contrary to common belief, marijuana is addictive. 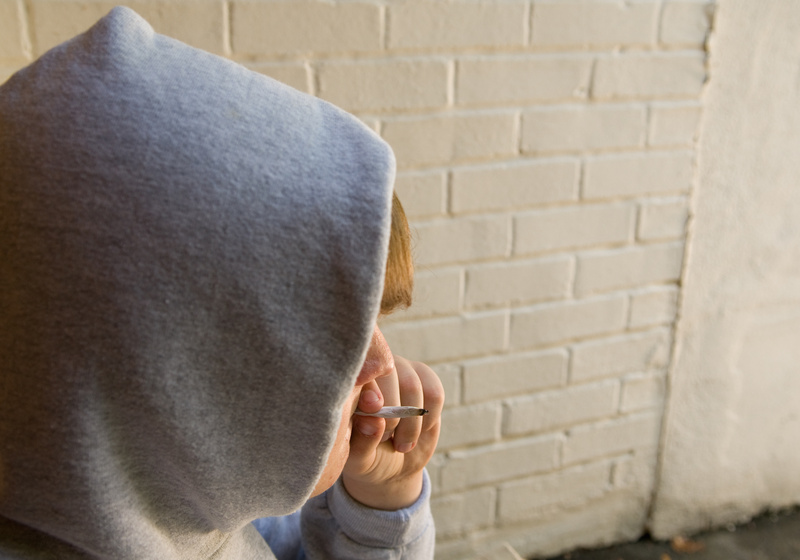 Estimates from research suggest that about 9 percent of users become addicted to marijuana; this number increases among those who start young (to about 17 percent, or 1 in 6) and among people who use marijuana daily (to 25-50 percent). Long-term marijuana users trying to quit report withdrawal symptoms including irritability, sleeplessness, decreased appetite, anxiety, and drug craving, all of which can make it difficult to abstain. Behavioral interventions, including cognitive-behavioral therapy and motivational incentives (i.e., providing vouchers for goods or services to patients who remain abstinent) have proven to be effective in treating marijuana addiction. Although no medications are currently available, recent discoveries about the workings of the endocannabinoid system offer promise for the development of medications to ease withdrawal, block the intoxicating effects of marijuana, and prevent relapse. How does marijuana affect a user’s life? Research shows marijuana may cause problems in daily life or make a person’s existing problems worse. Heavy marijuana users generally report lower life satisfaction, poorer mental and physical health, more relationship problems, and less academic and career success compared to non-marijuana-using peers. For example, marijuana use is associated with a higher likelihood of dropping out of school. Several studies also associate workers’ marijuana smoking with increased absences, tardiness, accidents, workers’ compensation claims, and job turnover. Read more on marijuana. From NIDA, National Institute on Drug Abuse. Last updated January 2014. Self-education and this brochure are helpful. Order or download the short booklet, Teens & Weed: Still a Big Deal; A Parent’s Guide to Talking with a Teenager about Marijuana published by Rosecrance. NIDA puts out the booklet, Marijuana: Facts Parents Need to Know (revised) or read about it on that page. For teens themselves, you can order the, Marijuana: facts for teens (revised) booklet by the National Institute on Drug Abuse, or they can log on themselves to NIDA for teens. If they don’t like the name of that agency, try AbovetheInfluence.com for younger teens. Give me the facts about marijuana. Rosecrance offers general factoid information about marijuana specific to six states. Here is Wisconsin’s marijuana fact sheet, It’s drug sheet number 10 of 13 available info pages on various drugs. As I listed as a top pick On My Bookshelf, Reefer Sanity; Seven Great Myths about Marijuana is a short, informative read. The forward is by former congressman, Patrick J. Kennedy. Myth 1: Marijuana is harmless and nonaddictive. One in five teen drivers surveyed in a recent poll has admitted to driving under the influence of marijuana, according to a recent study by Liberty Mutual Insurance and Students Against Destructive Decisions (SADD). And many of these teenagers don’t seem to think driving while high is a big deal. Thirty-six percent of teens who have driven high say marijuana doesn’t distract them from driving, the report continues. But marijuana does seem to affect drivers. Pot is the most common illegal drug found in drivers who die in car accidents, according to “Marijuana: Facts for Teens,” a booklet published in 2001 and most recently revised in March 2011 by the National Institute on Drug Abuse. “Marijuana affects a number of skills required for safe driving—alertness, concentration, coordination, and reaction time—so it’s not safe to drive high or to ride with someone who’s been smoking [pot],” the NIDA booklet continues. High drivers have a hard time judging distances and reacting to signals and sounds, NIDA adds. — US News and World Report, March 7, 2012 by Laura McMullen. Seven years ago I proudly reported to my 20 year old friend, “I know about drugs.” “No you don’t, Sarah.” I looked at her. “You don’t. It’s a much different world than when you were our age.” Oh man, was she right. “Marijuana products today are far stronger than in the past, which may explain why more people are overdosing or getting into car accidents, Volkow (director of the National Institute on Drug Abuse) says. The concentration of the main active ingredient in marijuana – tetrahydrocannabinol, or THC – has quadrupled (emphasis mine) since the 1980s, increasing to about 12% today, according to a June article by Volkow in The New England Journal of Medicine. Some of the new, edible marijuana products – from cookies to chocolates – can be 10 times stronger than traditional joints.” Read the rest of the USA Today article, Marijuana Poses More Risks than Many Realize with more questions and answers about marijuana. “Some marijuana samples show THC concentrations exceeding 30 percent. If we were talking about alcohol, this increase in intoxication potential would be like going from drinking a “lite” beer a day to consuming a dozen shots of vodka.” From Reefer Sanity: Seven Great Myths About Marijuana. “Though alcohol (notably beer) remains far and away their drug of choice, teens are three times likelier to be in treatment for marijuana (partly as a result of drug courts) than for alcohol and five times likelier to be in treatment for marijuana than for all other illegal drugs combined.” From High Society: How Substance Abuse Ravages America and What to do About It. This is a whole other debate. Consider a few things as an introduction; “Our two legal drugs are the biggest contributors to healthcare costs in this country…The costs of these drugs to society greatly overshadow any gains derived from their taxation…These costs — from healthcare expenditures due to alcohol and tobacco use, to lost productivity to accidents — are ten times greater than any tax revenue federal and state governments receive from the taxation of these two legalized drugs.” From a report prepared for the National Institute of Alcohol Abuse and Alcoholism. “For every dollar in tax revenue we get from alcohol and tobacco sales, we lose ten dollars in social costs.” Kevin A. Sabet, Ph.D. Director of the Drug Policy Institute at the University of Florida. Educating Voices, Inc. is an excellent resource to get up to speed on all things marijuana. The American Medical Association has not approved medical marijuana. “The AMA’s 527-member House of Delegates decided during its interim meeting in National Harbor, Md., to retain the long-standing position that “cannabis is a dangerous drug and as such is a public health concern.” US News and World Report, Nov. 20, 2013.